Let's make a pact, okay? "I, [insert name here], do solemnly swear...that I shall not be unduly distracted by Rogue One and allow La La Land to go unseen, gobbled up, or forgotten altogether by the holiday season at hand." Now shake on it and pinky swear. I think you'll enjoy it; it starts with a bang, putters along sentimentally and never quite soars, but the story is timeless, the arrangements outstanding, the singing and dancing quite fun (think '1998 Gap swing dance commercial'), the 'aesthetics and look and set decorations' glorious, and while Emma Stone pales beside Ryan Gosling, it's an earnest, original, ambitious movie that deserves its month in the sun. It made me even kinda like jazz, which is growing on me lately. IMDB has La La Land hovering around an outstanding 8.9, just 4/10ths of a point below Shawshank Redemption. A rather generous score, me thinks. La La Land is 'very good,' perhaps periodically great, but something—dynamism and gravitas, perhaps—is amiss. Not earnestness, not authenticity, just periodic gravitas. I'm wanting to love, love, love it, but it can't quite seem to find its seventh gear. Remember how you felt about Russell Crowe in Les Misérables? Yeah, it's some of that feeling. And honestly, the way I sometimes felt about Hugh Jackman: "Man, that was great; if only he could sing just a little bit better...stronger...deeper." But hey, I'm no Randy Jackson, so who am I to call pitchy? And we can talk about the ending another time, in person. For now, at a minimum, I think the music will be nominated for all sorts of Oscars, and probably the choreography, too, but I'm not quite sure about the rest. Hard to say. In the same way The Artist and Les Misérables were original, and got traction with January and December audiences, respectively, perhaps La La Land can, too? Here's hoping, though I think it's a bit of a long shot, because the posters may be trampled upon by everyone herding into Rogue One, then Collateral Beauty, Why Him?, Sing, Passengers, Fences, Jackie, Lion, Hidden Figures, A Monster Calls, Live by Night, Silence, Patriots Day, Assassin's Creed, Underworld, Sleepless, Split, The Founder, and literally 22 other movies before February 1st. I will say this: whether you love La La Land or not, it will probably stick with you a couple days. Particularly the music. I find myself writing this review in a hurry, sitting beside a 4' wide bass speaker that is absolutely BLARING the soundtrack whilst I tap my toes and want to wrap it up quickly so that I can leap to my feet, do a backflip, and DANCE like Zac freakin' Efron. Rumor has it you'd pay good money to see that, wouldntcha? Until that day, enjoy the show! p.s. I saw it again tonight, four nights later—and with Lauren this time—and swooned. Now that I know where it's going, and why, well, I think it's ingenious and rather remarkable. So many details. So there: fickle is as fickle does. p.p.s. I've now seen it thrice. I can't let it go. It gets better every time, and the CimemaScope experience is amazing. The film is soaring at the box office, sitting now at >$70mm with only one week of wide-release under its belt. It has now scored the best per-theater average debut of any title in 2016, and the 10th-best ever. IMDB has it rising to 8.9, with critics across the country swooning in love and falling in line. Do see it; I think it will fare well at the Oscars. p.p.p.s. Saw it again this evening; fourth time. I REALLY cannot let it go! It's burrowed deeply into my brain, heart and soul like a little boll weevil! I think Lauren agrees. We roped a friend into seeing it, and gather she loved it, too. I do believe it's my favorite film of 2016. The last four times I sat this transfixed and enraptured were while watching Mad Max: Fury Road, The Revenant, The Hateful Eight and, most recently, The Accountant. Very different films, but equally magnificent. 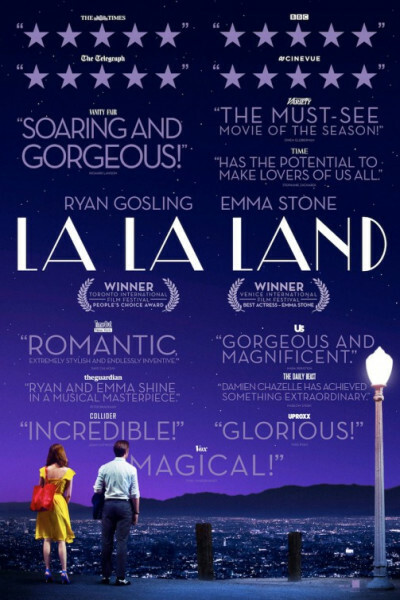 If you haven't seen La La Land, do yourself a favor and go already! p.p.p.p.s. Well, we saw it a fifth and final time tonight in the theater. Sad to let it go. The Academy announces Oscar nominees on Tuesday, 1/24, and I will wait with bated breath to see how La La Land fares. Eleven months from now, the Leaths intend to add it to our Christmas Eve viewing line-up which, for years, has only included Albert Finney's Scrooge. It'll now be a double feature night. Long live La La Land! I'm obsessed, though Yes, I do believe #10 might be the last one on the big screen? Depends on whether it wins a dozen Oscars and is re-released at the end of February. Now, it's become an easy friend and we enjoy coffee together.